Katie, Lola and I spent yesterday afternoon and the night at her parents’ house in rural Afton. They were out-of-town and we felt like some time in “the country.” It was a quiet retreat with books and movies and food. Snow fell for much of the day but as evening came the skies cleared, an almost summery meteorological moment. Around dusk, I took Lola for a stroll down the driveway and a short ways up the road. It was still and cold and silent, everything muffled by the couple of inches of fresh snow. The road was even covered, with a discernible number of tire tracks on it. On my way out of Afton this morning, I took a wandering route and drove slowly along lightly-trafficked roads. I stopped my car on the side of the road at the intersection of Valley Creek Road and Stagecoach Trail and walked around the corner to the little bridge over the creek. It’s the tendency of trout anglers to look over bridge railings into cold, clear streams. Valley Creek is known for its trout but none were visible from the bridge. The stream is pretty shallow and sandy in that stretch and in winter, the fish would probably be hunkered down in deep pools. It was here in about 1845 that Lemule Bolles constructed the first commercial flour mill in Minnesota. The Bolles Mill was constructed of timber collected from the shore of the St. Croix River and hauled to a site on Valley Creek just downstream of the Belwin Conservancy’s preserve. The mill had a ninefoot water wheel powered from a millrace – parts of which still exist today. The mill could produce about 50 barrels of flour in a day. The creek was at the time called ‘Bolles Creek’ and not long after Lemule constructed his mill, his uncle Erastus Bolles built a blacksmith shop nearby. The small settlement that developed nearby was in turn known as Valley Creek. When I turned 30-years-old last May, I took the day off work and went for a long hike with my dog at Wild River State Park. It was quiet in the park that day, the trees starting to get green and only the two of us on the trail to breathe it all in. Having recently gone morel hunting for the first time, my eyes were often glued to the forest floor, looking for mushrooms. I didn’t find any. But I did see all the delicate early-spring flowers; they seemed to be the first natural color I’d seen in months and months. I was just flipping through photos and experienced an almost unbearable sensation in these cold, snowy, gray winter days. It’s overwhelming to feel the longing of life in the landscape, still a good two months off, but also the joy of that annual deep breath the forest takes as the sun comes back to us. I thought I would share the pain and the ecstasy with you, readers. Click the images below to see larger versions. Click the larger image to see a very large version that might make an appropriate computer desktop this time of year. Any help identifying the flowers would be much appreciated. At the peak of winter, when all memories of warm green days are no more real than a dream about flying on the space shuttle, when summer’s return seems as remote as the moon, you should seek rock and roll music. On my way home this evening, a mark of the season worth discussing with a shop clerk was that you can now see your car when you go out to it at the end of the workday. February is a relief, but the night is still plenty long. Last night, I sought solace at the Cedar Cultural Center. The show featured one of my favorite bands, Retribution Gospel Choir, and an aspirational new Twin Cities duo called Peter Wolf Crier. Both bands performed inspired sets and with technical mastery. Just the kind of music for such a winter’s night. I drove across St. Paul and Minneapolis in fading rush hour, the light just gone from the sky. Riding shotgun was Wade, who I have spent many an evening listening to records with on his hi-fi stereo and have also seen Retribution with previously. And who has ridden shotgun in my car on similar ventures for going on 12 years. We went to St. Louis Park to pick up Erik, who happens to be a music critic for the City Pages alternative newspaper. Erik was reviewing the show; he was also at the last Retribution Gospel Choir show Wade and I attended six months or so ago. One wall of Erik’s living room is essentially crates of records. Hundreds of LPs. It took some looking, but he found Low’s album “The Great Destroyer” and we listened to it with a couple Summit EPAs. Much of Sparhawk’s music seems to be about bringing order out of chaos. On stage at the Cedar, he reminded us that for such work, we must accept some chaos. The band seemed to lose control of the music at a few points in the second half of the set, but always just when it was most needed the hooks came back and Sparhawk lunged back to the microphone to rip out the song’s refrain, a memory distant like a dream. Retribution Gospel Choir and Peter Wolf Crier had been on tour together for about a month, playing many back-to-back nights. It had been my understanding that they were playing split bills, taking turns playing first and second, and both bands playing full sets. When I saw RGC was playing first, I assumed we’d see a full set. Sadly, they only played about 40 minutes before leaving the stage for Peter Wolf Crier. We went outside on the patio for one of our party to smoke a cigarette between bands. Another fellow who bummed a smoke struck up conversation. He was a Low fan (Sparhawk’s original and legendarily-slow and quiet band) and had not seen RGC before, but was impressed by the performance. The others on the patio were there to see Peter Wolf Crier, which has gotten a lot of play recently on The Current radio station. They were a little dismissive of the performance they had just seen. Two other fellows came out then and they too had not much to say about the music they had just listened to, and one said, “I think most people are here to see Peter Wolf Crier,” which I took to mean he certainly was. I don’t begrudge Peter Wolf Crier their fans, though, and they put on a searing performance. Singer-guitarist Peter Pisano did haunting things by employing a sampler to loop his howls, singing over layers of his own voice. They showed unrestrained respect for what their opener had done, talking at numerous times about how much they had learned watching Retribution play night after night on the tour. We stuck around after the show for a while. The band stood by the stage, chatting with friends and fans, the people left in the room only those who aren’t ready for the night to be over quite yet. They were selling a nice lithograph for a mere $5 and I got a copy and all three band members signed it. Alan Sparhawk was absent for the first several minutes; when he returned he not only signed the poster but chatted a bit. He said a couple times that he felt like the set was “indulgent” for the guys in the band. Indulgent, perhaps, but it’s how they wanted to play, and it’s what I wanted to hear. “Retribution Gospel Choir took the stage at the Cedar quietly, dressed in classic black. Alan Sparhawk (Low, Black Eyed Snakes), a man whose features barely deign to belie the old-timey battle between god and the devil within him…” Continue reading. She seems to be referring to what I wrote about above: order vs. chaos, creation vs. destruction. Fighting such a battle night after night should exhaust Sparhawk and the band. They seemed to only be feeling alive. It was exhilarating to watch. 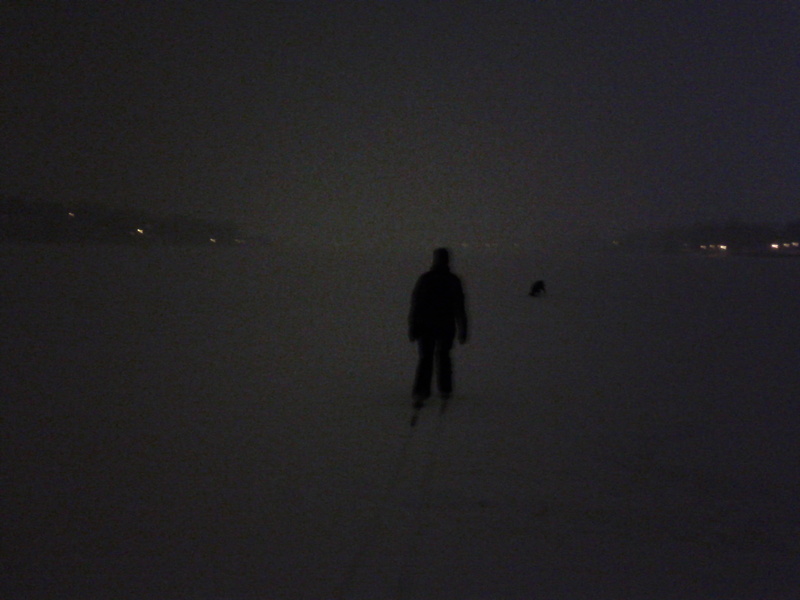 We just took a little sojourn out onto Lake Phalen with Lola. It was bright and sunny but only a couple degrees above zero — and temperatures are supposed to keep falling pretty drastically. Surprisingly, there wasn’t anybody out fishing. She loves the ice, though right now there is only an inch of snow over slick ice and she was having trouble running at top speed without her back legs going out from under her.